Thanks to our marketing team at Zondervan for this fantastic press release to announce our upcoming book, Nourished. : A Search for Health, Happiness, and a Full Night's Sleep. Grand Rapids, Mich., August 18, 2014 — A laid-back mom who finds comfort in clutter and her order-loving, thirty-something daughter, humorously explore how to tackle the top ten stressors that mess with a woman’s mind—especially her peace and joy—in their new book “Nourished: A Search for Health, Happiness, and a Full Night’s Sleep” (Jan. 6, 2015). What to Cook for Dinner … Again! 1. Gently (and sometimes, radically) altering a few targeted areas. 2. Accepting and embracing what we can, including our imperfections. The authors believe that by simultaneously making a few changes, while still appreciating the here and now, we nourish our lives, but never have to put happiness on hold. Through trial and error plans, fascinating research, and practical take-aways, readers are equipped and encouraged to make sustainable, nourishing changes—within and without—that last. Becky Johnson is the author, coauthor, or collaborator of more than forty books. Most recently, she co-authored We Laugh, We Cry, We Cook (Zondervan 2013) along with a blog by the same name with her daughter, Rachel Randolph. She and her husband Greg, live in Denver, Colorado where they love spending time with their adult children and grandkids. Rachel Randolph writes and speaks with humor and honesty about parenting a toddler, young married life, and her mostly plant-based cooking adventures. Rachel is married to Jared, a high school football and baseball coach. They live near Dallas, Texas with their son Jackson. 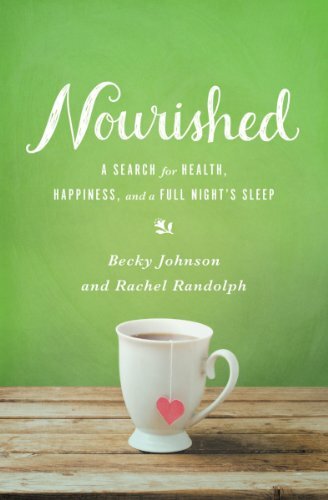 Nourished will be Rachel’s second book. Zondervan is a world leading Bible publisher and provider of Christian communications. Zondervan, part of HarperCollins Christian Publishing, Inc., delivers transformational Christian experiences through its bestselling Bibles, books, curriculum, academic resources and digital products. The Company’s products are sold worldwide and translated into nearly 200 languages. Zondervan offices are located in Grand Rapids, MI. For additional information, please visit www.zondervan.com.